Earn 1 additional Velocity Point per $1 spent on eligible Virgin products and services. 1 x complimentary Virgin Australia return domestic flight every anniversary year. 2 complimentary single entry passes to the domestic Virgin Australia lounge each year at selected airports. Receive 100 Velocity Frequent Flyer Status Credits, when you spend a minimum of $50,000 within your Card Membership year. Card Members who currently hold or who have previously held any other Card product offered by American Express Australia Limited in the preceding 18 month period are ineligible for the sign up bonus points. The complimentary flight is not eligible for Velocity Points and/or Status Credits earn. If you’re doing a balance transfer then there’s a 1% balance transfer fee. The introductory points offer excludes existing American Express Card Members. This introductory offer is available to new American Express Card Members only. #Entry into The American Express Lounge is governed by the full Terms and Conditions available at amex.com.au/airportlounge. Amex is making sure that it has all bases covered with its American Express Velocity Platinum Credit Card. While thrifty Virgin Australia customers may be attracted by the Amex Velocity Escape Card, truly frequent flyers – for whom both domestic and international travel are a regular occurrence – will be looking for something more. The inclusion of the word ‘Platinum’ in this card’s title is a sure indication that they will find all that they are expecting, with lots of bonus Velocity points to ice the cake. Let’s get the housekeeping out of the way by crunching the mundane numbers to begin with. Minimum income requirement. You’ll need to demonstrate an annual income of at least $65,000. Annual fee. Yes, you will pay an annual fee – $375 every year – but if this is the kind of card you are looking for you will understand that some contribution must be made to the cost of the so-called ‘complimentary’ benefits. In reality you are buying extensive insurance, travel benefits and accelerated rewards earning at a heavily discounted rate. It’s a bargain if you can make good use of these privileges, but a waste of money if you can’t. Supplementary cards are provided at no additional cost. Balance transfer offer. There’s a balance transfer offer if you need it, allowing you to bring across up to $10,000 from your existing non-Amex card and pay no interest for 12 months. However, you will pay a 1% credit plan establishment fee upfront, the equivalent of slightly more than 1% p.a. in interest (given that you will be reducing the balance with minimum monthly repayments). Add to this the fact that you’ll lose any interest-free days on purchases while you have a balance outstanding (interest will be applied from the date of each individual purchase until your full repayment date) and the offer doesn’t look particularly tempting unless you are currently carrying heavy credit card debt. Interest rate. The ongoing purchase interest rate (and balance transfer revert rate) is 20.74%, a typical level for a platinum card. Amex is probably assuming that platinum card users will not be planning to maintain an unpaid purchase balance for long periods. Cash advances are not available on this card, so there’s no cash advance interest rate quoted. Interest-free days. You won’t get any long introductory interest-free period on purchases, but, thanks to the monthly billing cycle, you will get up to 55 interest-free days each month – much better than the up to 44 interest-free days offered by some competing cards. Now that you know how much the card is going to cost you, and what other financial incentives or deterrents are involved, it’s time to look at the rewards points, travel benefits and insurance that you will get for your money. You’ll earn uncapped points in Virgin Australia’s Velocity Frequent Flyer program when you use your card for purchases, and you can redeem the points for flights and seat upgrades with Virgin and its global airline partners, as well as for other kinds of travel, accommodation, car hire, BP fuel purchases and gift cards or merchandise from the Velocity Rewards Store. Securing award flights is the most productive way to use the points, giving them a redemption value of around 1.3 cents per point, compared with only about 0.5 cents per point if used for gift cards. This means that you’re getting an extra 0.5 points per dollar on most of your spending when compared with the Amex Velocity Escape Card. If you were to spend a total of $20,000 a year on the card and use the extra 10,000 points for flights, the higher earning rate alone would be worth around $130 per annum. The absence of any kind of points cap or threshold is also an attractive feature when compared with many competing rewards cards. Using the same estimate of 1.3 cents per point (for award flight redemptions), it’s possible to put a value of $650 (or three return economy flights between Sydney and Melbourne or Brisbane) on the 50,000 ‘Welcome aboard’ bonus points that you’ll receive for spending $3,000 in the first three months of holding the card. Unfortunately, you won’t qualify for the bonus points if you’ve held any kind of card directly issued by American Express itself in the last 18 months. However, the bonus points will be credited to a new cardholder who is a current or recent holder of an Amex companion card (i.e. a card issued by one of the Big Four Banks as part of a dual account with a Visa or Mastercard). Free flight every year. Amex welcomes you as a new cardholder and then wishes you a Happy Anniversary every year, with a complimentary return domestic economy flight following your first card spend in each 12 month period. 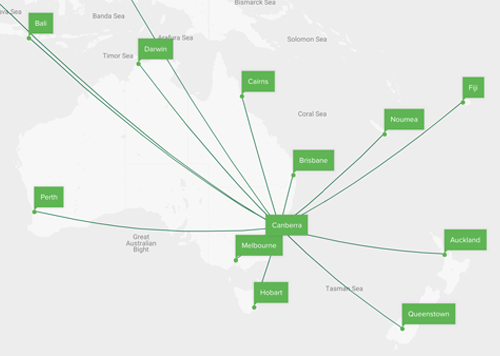 The long list of domestic destinations provides a flexibility not matched by cards linked to Qantas, which usually offer complimentary flights between mainland state capitals only. A Virgin return flight between Melbourne and Brisbane is worth at least $293. Lounge passes. Each year you’ll get two complimentary single entry passes to the domestic Virgin Australia lounge at selected airports. Depending on your Velocity membership level, lounge access costs at least $300 per year, or $65 for a single visit, so these two passes are worth $130 if you are the kind of traveller who uses and appreciates an airport lounge. You’ll also get two single entry passes to the American Express lounge at Sydney international airport, worth $55 each. That’s a total of $240 per year in lounge pass value. Regular travellers know the value of airline status credits, which help them to maintain elevated membership tiers like Silver, Gold and Platinum. These higher membership levels confer benefits such as priority service, check-in and seating, lounge access and additional baggage allowance. In any year where you spend at least $50,000 using your card, you’ll receive 100 status credits to help you maintain your membership level. Complimentary domestic and international travel insurance. You and your family will be covered for emergency medical expenses, flight delays and missed flights or cancellations, transport accidents, personal liability and lost, damaged, delayed or stolen luggage, when you purchase your full trip fare with the card or with Velocity points. (Note that supplementary cardholders are not covered unless they are the spouse or child of the primary cardholder, and there’s no rental vehicle excess cover.) This type of multi-trip travel insurance costs at least $430 for a fairly basic policy. Personal items purchased with the card are covered against theft, loss or damage for 90 days – they’ll be repaired or replaced – and if a retailer refuses to accept return of an unused item within 90 days, Amex will provide a refund instead. It’s difficult to ascribe a price to this kind of insurance, but it can be valuable if you ever need to use it. There’s no extended warranty or purchase price protection insurance, however. Amex’s award-winning service is also a kind of insurance, providing 24/7 card support worldwide, online fraud protection and emergency card replacement. For extra convenience, the card is enabled for contactless payment via your phone or other mobile device through Apple Pay, Samsung Pay or Google Pay. The annual cost of holding this card is the $375 annual fee. The purchase protection and refund insurance policies are not included in the above calculation, and the once-only 50,000 bonus points (potentially worth $650) are also excluded. But it’s easy to see that this is a card which could deliver a positive financial benefit every year to a frequent flyer who chooses to travel with Virgin Australia and its partner airlines. Virgin Australia has its own premium card offering Velocity rewards – the Virgin Australia Velocity High Flyer Credit Card – with a lower annual fee but a much less attractive points earning rate. The NAB Velocity Rewards Premium Credit Card has an even lower earning rate and a restrictive points cap, and there’s no bonus rate for spending with Virgin Australia. If you fly regularly with Virgin Australia, you should take a serious look at this card. Check out the various benefits against your own spending pattern and lifestyle, to work out whether the American Express Velocity Platinum Card’s extensive rewards, travel and other benefits will deliver for you. I got this card for Velocity points and there is an annual fee. The worst thing is I mostly need to use my Visa card (which earns less points) because American Express can’t be used in a lot of places. Also some places charge an extra fee for American Express cards. I pay my annual fee, and I get my international lounge passes and domestic flights. I get insurance on holidays and purchases I make. I get points for my spending. Overall I’m happy with this card. The only downside is that not everywhere accepts American Express, which is why I also have NAB’s combined AmEx and Visa card. The best credit card I have used to date: free flight and so much insurance coverage, which allows me to shop online tension-free. It rewards me with lots of Velocity points, which will help me with a lot of travelling. I also get bonus points for a referral. I love this card! This card has good points earning potential, especially if you take advantage of a referral or sign-up bonus. The annual fee of $395 is quite high but it is offset by insurance, lounge passes and a return domestic flight each year. This is my first year with the card and so far I am quite happy and will likely renew. In the six months that I’ve had my AmEx card I have been extremely impressed with it. There are so many offers and benefits that it makes it very worthwhile. I would thoroughly recommend it to anyone who is eligible. I particularly like that they aim to support local small businesses and give users extra bonuses for shopping at these stores. The major draw was the 100,000 (or 80,000) Velocity points for signing up, and while some people might be put off by the $349 annual fee, this is balanced out by the 1 free domestic flight per anniversary year, 2 free domestic lounge entries, and 2 free AmEx Lounge entries at Sydney International airport. Add on the complimentary travel insurance (up to 60 days), 3 points per dollar booking Virgin flights, 2 points per dollar booking travel related items, plus 1 point per dollar for everyday purchases, and this card is very good value. I loved maximising the platinum benefits of this card—great monthly partner offers, travel insurance, and an annual domestic flight free were the standouts. The card also gave free access to an international travel lounge at Sydney International, which we use quite a few times a year. All round, a great platinum AmEx offering for a low annual fee compared to other platinum cards on the market. This was an absolutely smashing offer. After analysing card upon card in the market, this offer exceeded all expectations. I have greatly benefited from this points offer! I purchased a flight to LA with this bad boy and I have used one of the airport lounge passes already. First class service. While the $349 annual fee is on the high side, as a frequent traveller, the benefits more than make up for the fee. Living in Perth, I am able to treat myself to an annual flight to Sydney. It comes with two lounge passes, a perk normally reserved for Velocity Silver members and a decent travel insurance policy. In the internet connected world, ordering goods and services from online retailers will earn you two Velocity points per dollar. When travelling with Virgin Australia I earn 3 points per dollar, and when combined with the points from VA themselves you will net between 8 and 13 points per dollar, depending on your status level. The monthly bonus offers have proven to be worthwhile as well, as I have saved well over the annual fee on rebates from retailers I would normally use regardless. It is true that American Express is not accepted everywhere, and that some places charge an additional fee, so this card is not the card for every situation, and you will have other cards at your disposal, but there are many situations where it does extremely well. Overall I am happy that this card is a perfect match to my lifestyle and the rewards and bonus offers more than make up for the high annual fee.